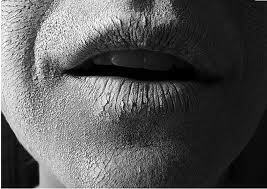 Everyone of them have dry parched lips. They look thirsty. So thirsty – parched. Dying of thirst. No water in sight. Alone. Yet, I am both here – with them – and carrying the canteen. You may want to click the links to read from the beginning. It is then I realize the sound. Or the lack of certain expected sounds, rather. I hear the water rushing. I hear the gentle breeze as it winds its way through the trees on the banks, around the pillars of people standing in the river, and across the ripples of the river. I heard the voice of the girl once I had tasted the river. I haven’t heard myself though. In conversing with the girl, it was only her voice I heard – not my own. Nor do I hear any noise from the multitudes in the river with me now. With this many people, my expectation would be to hear a cough, or cry, or laugh, or sigh. With the water rushing past each one I would expect one to falter and splash, or shiver at the least. Yet not a sound from them. “See them now?” It’s the voice of the girl. “Look familiar?” She asks… although I still haven’t heard myself answer her first question. No… I haven’t seen them before. Why can’t I hear myself? No, should they? Are you hearing my thoughts? Where are you? Who are they? Why worry about them? She almost sounds angry. An odd and unexpected reaction to my questions. I am still adjusting to this new world in which I live – I have no real understanding of what is happening in and around me. It was not my intention to disturb my new friend. But we are standing in a river. Water is rushing all around our knees. How can they be dying of thirst? The sound was raspy and garbled at first – odd for a single word to garble. But I heard it. My voice. And so I repeated it, until it was clear.